I can’t imagine anybody is happy about what’s been going on at North Albany County Park. But Benton County said those trees had to come down because they had fallen victim to a combination of poor soil, drought and bugs. A section of the park, on its eastern side, now looks like a small clearcut. 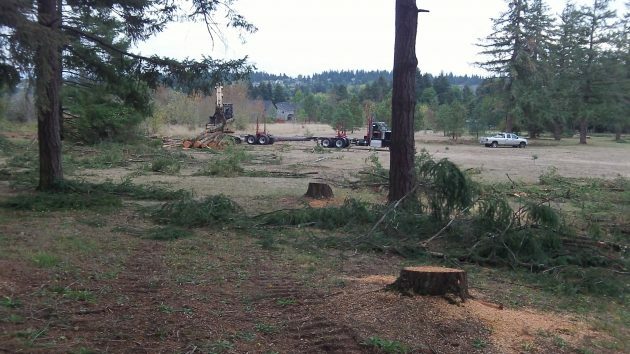 Throughout the park, scores of Douglas firs were cut down because they had become what the county called “hazard trees,” in danger of becoming snags and eventually crashing down on whatever or whoever was in the way. Loading a log truck at North Albany County Park on Monday. Takes care & time to load that log truck. Nice video! But “clearcut”? C’mon HH. Cut the hyperbole. Doubt you get as many comments on this one. No Guns….God …or gays to get the folk motivated to put two thoughts together and type. Oh my gosh, they took down almost all of the trees lining the roadway? I had no idea it was that bad. How heartbreaking. I’ve been walking around and through that park for years, what a loss. I live on Kingston, just to the north of the natural area. I cringe every time I drive by, worried about how many more trees are going to come down. I have confidence they’re doing the right thing but I think I’m kind of in mourning. A “Natural Area” with all the natural removed. Do we have to be protected from everything?